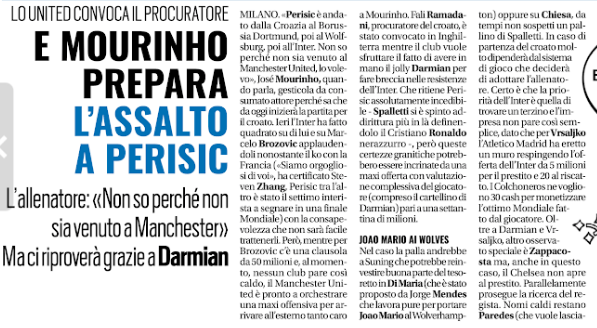 Manchester United are seriously interested signing Ivan Perisic in the summer transfer window and multiple renowned Italian outlets have covered the rumor today. La Gazzetta Dello Sport have reported that the Red Devils will not be able to start talks with the Nerazzurri if they offer less than 70 million euros (£62million) for Perisic. On the other hand, Tutto Sport have claimed the Old Trafford club are preparing to launch an attack for the playmaker, whose overall value is 70 million euros. It is further mentioned that Manchester United are ready to match that price by offering a player plus cash deal that would involve Darmian moving to the San Siro. Mourinho has been interested in the former Wolfsburg attacker for quite some time. The former Chelsea boss wanted to sign him last year and as per Sky Sports News, the PL giants were close to agreeing a fee for him, however, he eventually ended up staying with the Italian club. The 29-year-old star was top quality in the Serie A and helped Inter book a place in the next season’s Champions League. He started 37 league games for the 2010 CL winners and directly contributed in 22 goals (11 goals and 11 assists). At the 2018 World Cup, he was absolutely fantastic. He scored 3 goals and provided 1 assist and we have included him in our WC team of the tournament ahead of Eden Hazard. Perisic is a left footed player, who likes to play on the left wing and at the moment, that position is being occupied by Chilean international Alexis Sanchez at Old Trafford. Nevertheless, the duo have proved to be fruitful in multiple attacking positions over the years and Mourinho’s offense will largely improve if he can get the deal done for the Croatian.